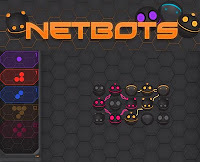 Netbots is a science fiction point and click puzzle game from sunrizegames. It features challenging puzzles with well balanced levels and a not bad at all storyline. Apparently, the scientists from the netbots laboratory need your help thus you connect the dots to make figures that are given to you. This game is played entirely by mouse dragging and clicking to place a shape by drawing it directly on the netbots. Meanwhile, here is a Netbots walkthrough in case you missed out on the hint feature.